After two of the most absurd travel experiences of my life yesterday, I made it home across the moonlit prairie in the wee hours of the morning today. Just in time to spend a couple days off with my two favorite cowgirls who have new surprises that arrived in the mail from Mama Jane in GriggsDakota. 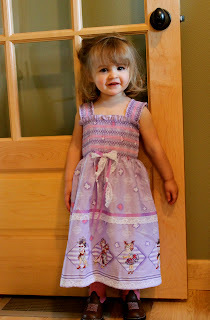 made from Fancy Nancy fabric. Fancy Nancy books are favorites. The girls love the books so much we read Fancy Nancy every night before bedtime and anytime in between they can squeeze it in throughout the day. Mama Jane (my mom) knows how to makes our girls smile. And she definitely saves on our clothing and shoe spending for the girls! 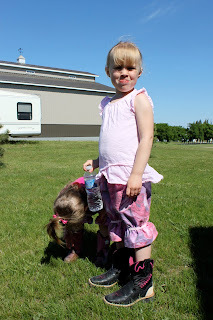 Miss E is making a fashion statement with her new boots by wearing them with shorts. 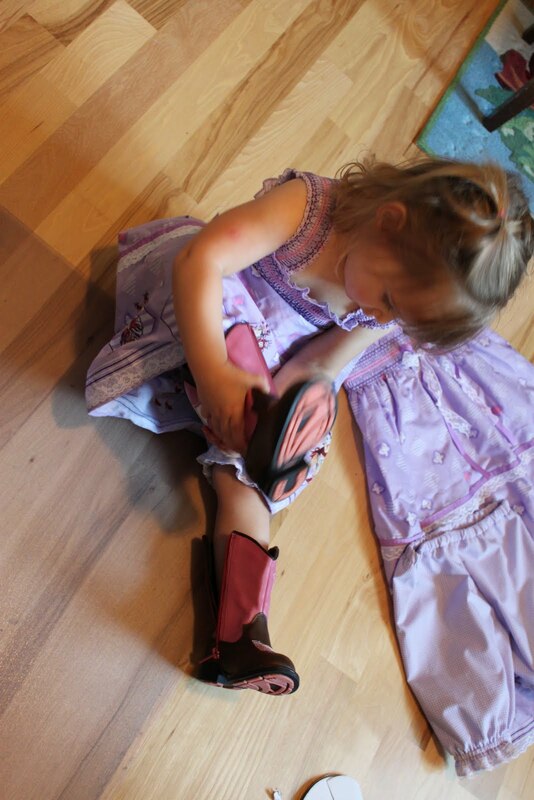 But Miss A is pleased as punch to never take this Fancy Nancy dress and her light up cowgirl boots off. And I am pleased as punch to be at home after the craziest cab driver screamed at me in Miami about how and why he hates credit cards and then a hard sprint to make my connection last night. Today though I am blogging from the sunny deck with girls playing beside me with a fresh mug of coffee. 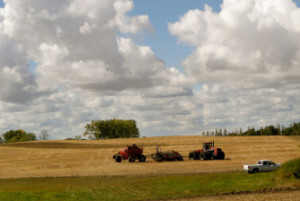 We’re going to enjoy a couple days at home, Hunter’s baseball games and then off to have a family weekend at my parent’s farm. It’s just what I need: downtime with out a hard and fast schedule. Tomorrow as a tribute to Father’s Day, I am going to have a blog hop up. Many of us will be blogging about dads and grandpas special in our lives this weekend for Father’s Day. I thought it would be fun to link up and share our stories between one another. Look for it early tomorrow. Until then, I am off to play Fancy Nancy, read Fancy Nancy and maybe weed the garden after a walk and visit to the park. What is your favorite thing to do on a day with out a schedule? So glad to hear you’re home with the girls. 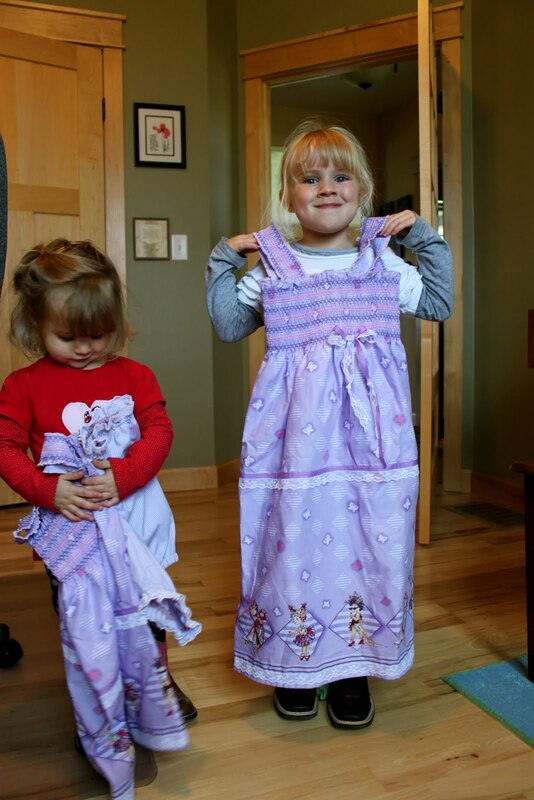 Mama Jane did a fabulous job on the dress and where did she find those cute little boots!? I might have something in common with Miss A and E. When I don’t have a schedule I like to go boot/dress shopping, get some lawn/yard work done, play with whatever new horse we have in the pen and take a jog. Aw, what cuties. Love the one they’re pulling up the boot. lol. Love the light up boots. We have the same ones but of course they are in blue! They too are loved in our household. No Fancy Nancy dresses. Maybe I will make one for myself. Don’t hold your breath, that would mean I had time to sew! Adorable little women you have there! Enjoy a great long weekend. Your girls are adorable! I love the dresses and boots! Your mom is an amazing seamstress. Makes me wish I had nieces. 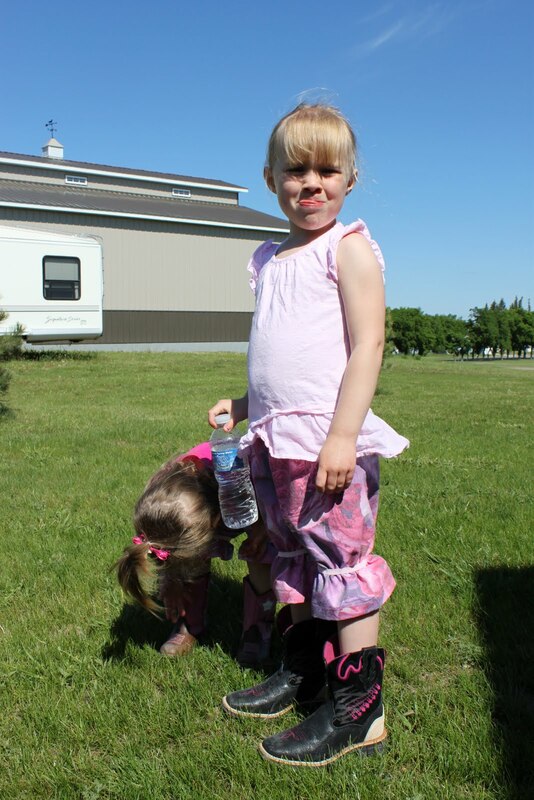 Love girls in boots – with jeans, dresses and shorts! All 3 are an everyday fashion statement in our house – yes even for me, I am always working in my boots and jeans with the cows – pretty much passed caring what others think as they drive by! OK that should of said I work in boots and SHORTS! Ok this cowgirl wants some fancy nancy light up boots in big kid size!!! Too Cute! 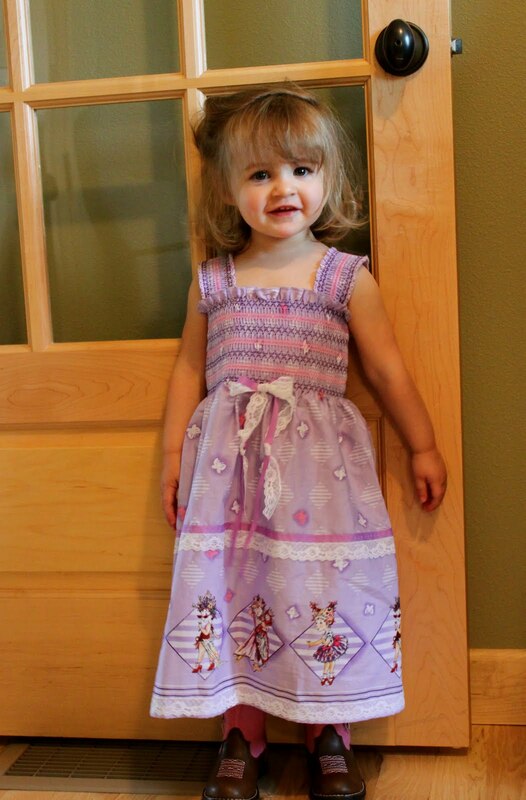 We love Fancy Nancy here at our house too! LOVE the boots. I used to wear mine with shorts when we line danced in the summer months, back in the day. I remember one denim dress I would wear to school with my red cowboy boots. I taught English with an attitude when I had my boots on! I would hide away and read if I were by myself with nothing to do. With Steve and the girls, I would whisk them away to a beach and watch the girls play in the ocean……..sigh….